This B&H Kit combines the Drobo B810i 8-Bay iSCSI SAN Enclosure with eight Seagate 6TB IronWolf 7200 rpm SATA III 3.5" Internal NAS HDDs for a total storage capacity of 48TB. Designed for small businesses to provide reliable and high performance storage servers for processes such as file services, data protection, email, and server virtualization, the B810i 8-Bay iSCSI SAN Enclosure from Drobo integrates seamlessly into your TCP/IP network infrastructure and utilizes the industry-standard iSCSI protocol to provide simple and consolidated storage for your servers. It is equipped with three Gigabit Ethernet ports, two of which provide data and one of which is for management. 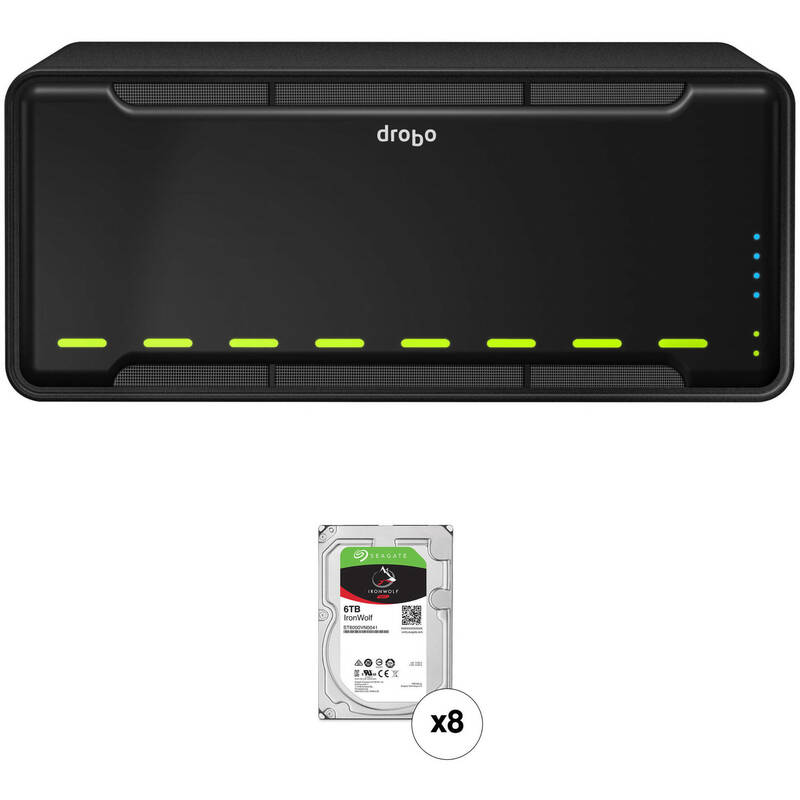 The Drobo B810i has eight 3.5" drive bays which are able to support up to eight SATA hard drives or SSDs, with no tools being required for installing 2.5" SSD carriers. As SSDs are able to operate with faster data transfer speeds, Drobo's hybrid storage option and Data Aware Tiering allow the most frequently accessed data to be stored on the SSDs, while less accessed data is stored on the hard drives. The result is fast redundant storage with an efficient read cache. The drive bays in the B810i also are also compatible with 4KN media. The Drobo B810i has also been built on BeyondRAID technology. If there are any empty drive bays, BeyondRAID allows additional drives to be inserted into the array, where they would be automatically configured. If all drive bays are occupied, simply replace the smallest capacity drive with a larger one and BeyondRAID will handle the rest. BeyondRAID is also what allows drives of varying capacities to work in the same unit, which helps enable future expansion as larger drives become available. Built with a desktop form factor with a 3 RU / 19" rackmount kit available separately and controlled using Drobo's Dashboard software, the B810i is powered using an internal 100/240 VAC power supply that operates at 1.8/0.75A and 50/60 Hz. It is compatible with Windows NTFS, Mac HFS+, and WMware VMFS file systems. Included are 1 x 6.0' power cord, 3 x 6.0' Ethernet cables, and international (Dutch, French, & Japanese) LED labels for the front panel. The Drobo B810i is protected by a limited 1-year warranty. A Drobo B810i iSCSI array can hold up to eight SATA hard drives of any capacity. To expand the storage capacity of an array, BeyondRAID enables additional disk drives to be inserted into empty drive bays. These new drives are automatically and transparently configured for use in the array without user intervention. However, if all drive bays are occupied, simply replace the smallest capacity drive with a higher capacity one and BeyondRAID will do the rest. The Drobo B810n moves beyond manually tuning an array for applications that have different storage requirements. Its ability to automatically tier frequently used transactional data from stored data that's seldom used enables businesses to consolidate storage resources and share that storage across all connected clients and their applications. Drobo Dashboard is an easy-to-use administration tool to centrally manage all your Drobos. It displays the status of all of your Drobos as if they were right in front of you. Number of Bays 8 x 2.5"/3.5"
Box Dimensions (LxWxH) 17.0 x 15.4 x 11.4"